To better support the quarterly workflow of preparing and leading a course, the new MyUW provides an upgraded Teaching page. MyUW closely integrates with other teaching and learning tools and the registrar’s systems, to make use of these tools more efficient. Watch a quick video overview of the teaching summary on the MyUW home page, the teaching page, and the course instructor dashboard. Each course you teach is represented by a course details card, with links to the class, student lists, course materials and grading information and submissions. Also visible is grading information (you’ll always know the deadline for submitting grades, because it always appears on the Teaching page). Order textbooks, access Canvas and find more campus and online resources for teaching. 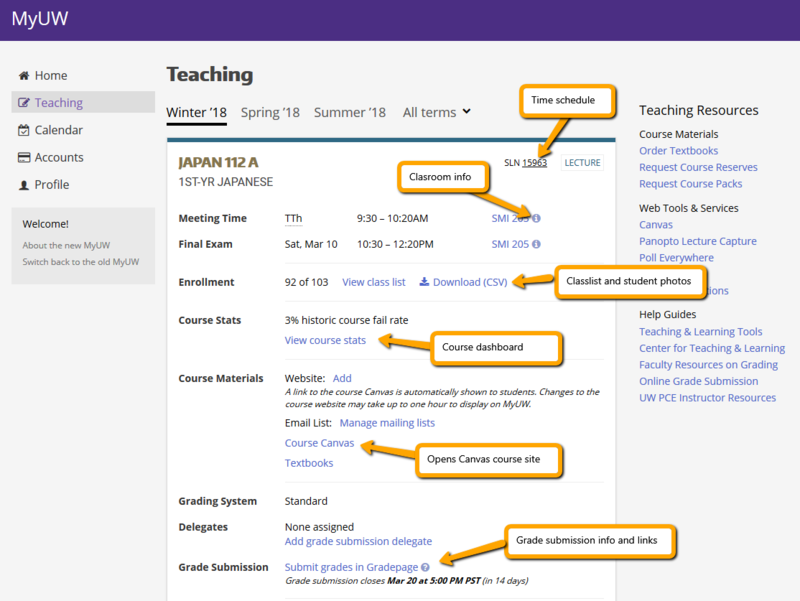 And because instructors sometimes need to review previous work, you can navigate back through six years of previous teaching via the All terms tab at the top of the Teaching page. Teaching resources — course reserves, web tools, help guides and more — are easy to find on the right side of the Teaching page. The Instructor Course Dashboard — accessible via the View course stats link on the course details card — displays aggregated data from the courses instructors are currently teaching, and data from previous offerings of the same course. Course dashboards help instructors with course planning, assessing their teaching practices, and improving the classroom experience. For example, instructors can view the distribution of majors and the courses that students are taking concurrently helping them make connections between student interests and the course’s subject matter.